MIA–but here Why…Flourishes New Releases! Yes, I have been missing in action for a little while. I have been working very hard on the sets for release Wednesday by Flourishes,llc. We are releasing three new sets and one set released on April Fools Day…a bit of a joke there. 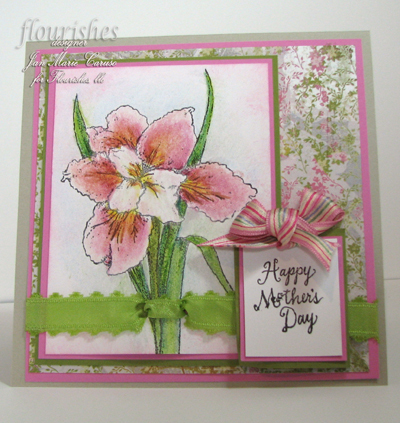 So what are the new sets: Siberian Iris –a original set of images by Marcy Hawley for Flourishes. They are beautiful, featuring wording for Mother’s Day and the name of the flowers as well. Wedding Party— an very cute bridal set, including bride & groom, a row of brides maids, lone bride and lone bridesmaid. These were illustrated by a SCSer, Sophie La Fontaine. This set works wonderfully with its companion set, Wedding Essentials. Wedding Essentials- in Flourishes fashion beautiful scripted words, Save The Date, We’re Engaged, Mr & Mrs, and beautiful wedding bands and of course a flourish! Head on over to the Flourishes webstore by clicking Here. Great new ribbons there too! There you can see the other new set Menswear that got out thru a little April Fools Joke. I think my Mom will like it….it will be a surprise if she isn’t reading this too! I used my Prismacolor pencils and simply blended them with a colorless blender pencil. The background is lightly colored with sky blue and the edges were sponged with Color Box-Cat eye in Pink. This is gorgeous, Jan — just love how you colored your Iris — it is so realistic!!! What a beautiful card, Jan! I love your coloring and that green ribbon is something that I just have to have! Thanks for sharing!